Heaven knows that the last truly solid Black Label Society album was released a long, long time ago, but it seems that each album Zakk and co have released in the meantime has something to recommend it, and full-length number nine is no exception. No, it's not full of the ripping heavy metal pounders that we wish BLS would go back to producing full-time. Instead, it's taken a page from modern Alice in Chains (or so it seems to my ears) making for an album of guitar-driven heavy metal songs that walk a fine line between heaviness and tunefulness, avoiding insipid balladry for the most part and sounding, dare I say it, mature. Yes, although the album title is anything but, this is the most grown-up and down-to-earth I've heard Black Label Society in a long time, with even the infamous random pinch harmonics at a minimum. That Alice in Chains influence pops up frequently enough to make me sure that I'm not hearing things. Opener Fields of Unforgiveness has some very Cantrell-esque moaning from Wylde before the riffs begin properly, and they have the sludgy, laid-back style of the Seattleans. The guitar hero soloing and Ozzified sneer in the vocals prove you're listening to another band, though, and despite hints elsewhere like My Dying Time's dual-sung verses, this is BLS through and through. Not that that's a bad thing, of course – said My Dying Time's mid-paced bluesy churn would be excellent even without the soloing. Believe, where the Ozzy influence is so thick it's dripping, is a fun, catchy listen akin to the better solo output of the great man, and Heart of Darkness, Damn the Flood, and Beyond the Dawn have plenty of the heavy chug that we know and love. The ballads, well, they vary. Angel of Mercy is dull even with the knowledge that ex-Dream Theaterer Derek Sherinian played the piano, but has a decent guitar solo. Scars, however, is a bit more memorable and has better guitarwork, and album finale Shades of Grey is a surprisingly good closer, soulfully sung and catchy with it. But even when the ballads are skipped, there's still plenty of heavy metal meat on the bones, late-album tracks like I've Gone Away and the doomy Empty Promises well-written and catchy, showing Wylde to be as able a vocalist as a guitarist. 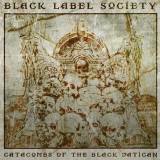 Ultimately, Catacombs of the Black Vatican is a varied and fun album that moves from heavy metal crunch to bluesy meander easily, showing Zakk's skill at songwriting well and reminding us that there's plenty of fuel in the tank yet.